PHUKET: Lifeguards stationed at Patong Beach revived a 76-year-old Russian tourist from drowning at Patong Beach late yesterday afternoon (Mar 11). The tourist, Valentina Mitrofanova, was seen struggling in the water and brought ashore in front of the Holiday Inn Hotel at about 4pm, reported Phuket Tourist Police. 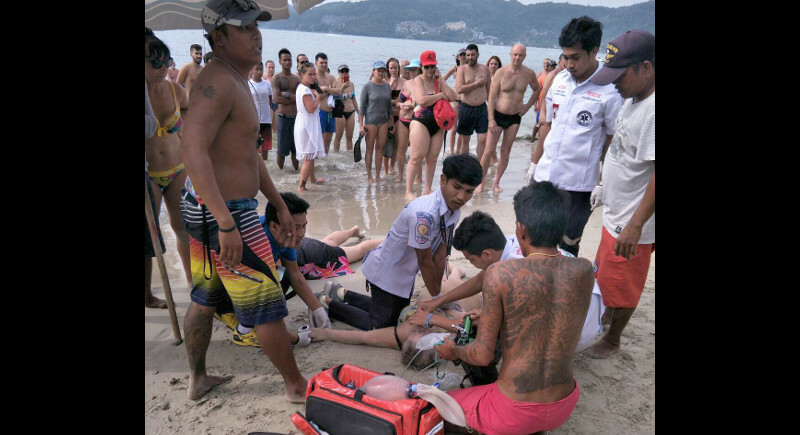 Rescue workers at the beach were forced to administer CPR (cardiopulmonary resuscitation) before rushing Ms Mitrofanova to Patong Hospital, said the Tourist Police in their report. Ms Mitrofanova was then transported to Vachira Phuket Hospital in Phuket Town, the report added. “Accirding to the rescue workers who travelled [with Ms Mitrofanova] to Vachira Hospital, Dr Niran Kwanmueang said Mr Mitrofanova still had low oxygen levels and pressure problems,” the police noted. “She has to wear a respirator and must be under close medical watch,” said the report. Ms Mitrofanova arrived in Phuket on holiday yesterday (Mar 11) on a tour provided by Pegas and was staying at the Arita Hotel on Pracha Nukroh Rd, the Tourist Police also reported. She had planned to return to Russia on April 9, they added. Comments posted on here by R... are the perfect example of superfluous nonsense  based only on assumptions.Something that happens regularly all over here.Same with the bus accident in Krabi lately.Poster not witnessing that accident,but blame the bus driver.Typical biased attitude by some experts/expats here. Excellent job...well done. The uninitiated arm chair rescuer with no training whatsoever has a dam cheek to question your efforts. No just plain common sense. The commentator was not there so does not know the situation, or what and how treatment was given nor is it stated. The commentator is not medically trained nor have any idea what training and from whom these people have. It is an article with a successful outcome and no doubt a relieved family. All praise to the efforts of the rescuers. "The Doctor doesn't need to be there. Common sense really" read the story, read my comments, you simply failed to understand... someone is losing the plot. The Doctor doesn't need to be there. Common sense really. Low blood pressure means the heart is still pumping, not stopped. The doctor, you mentioned, wasn't at the beach, read the article. If one bothers to read the article it states..."Dr Niran Kwanmueang said Mr (sic) Mitrofanova still had low oxygen levels and pressure problems."